Welcome to the Irish-Japan business community’s annual spring golf tournament. A great day of golf, networking and Irish craic! Date: April 14th, 2018 (Saturday), Meeting Time at the clubhouse: 09:00am (tee-off from 09:30am). *Includes green fee, cart, lunch, post-game reception food and drinks and great prizes! Our sponsor, Toyoko Inn, has kindly offered free accommodation at the Toyoko Inn near Ashikaga station(JR line) and Ashikagashi station (Tobu Line) (10 minutes by car from golf course) on the night of Friday, April 13th, for all players. Sign up is required by April 11th. 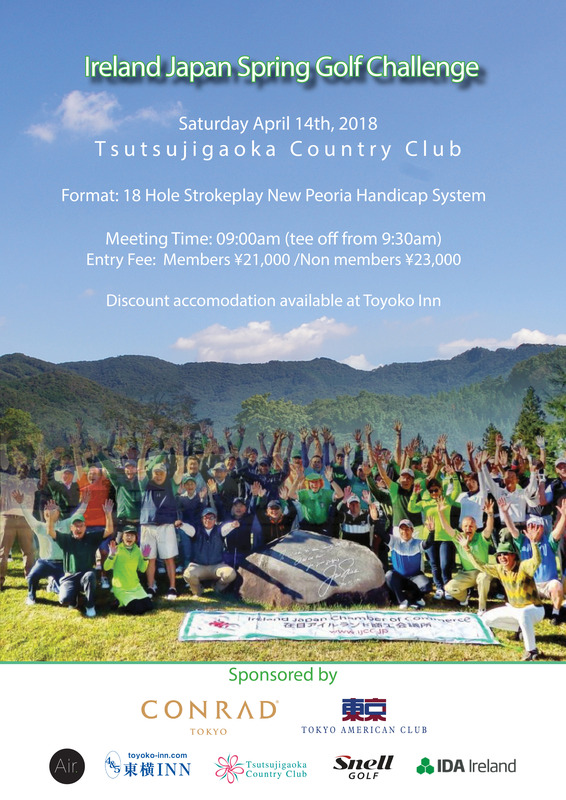 A bus will take golfers from the hotel to the golf course on April 14th morning, and back to Ashikagashi station, departing the golf club after the party. – Golf goodies and more! Format: We will use the Double Peoria System as a basis for obtaining a handicap and net score for each player. The 16th Mercedes-Benz - Cole Haan Cup!